XL-80 Laser Interferometer System, CMM - CMM Inc. The Renishaw XL-80 laser interferometer is the replacement for an older ML10 Laser Interferometer. XL-80 offers the ultimate in high performance measurement and calibration for motion systems, including CMMs and machine tools. Key XL system components are a compact laser head (XL-80), an independent environmental compensator system (XC-80) and a comprehensive and powerful software suite. Together with the measurement optics they form a highly accurate measurement and analysis system. All components can be stored and transported in one of the optional custom cases. The XL-80 laser produces an extremely stable laser beam, with a wavelength that is traceable back to national and international standards. Laser frequency stability ±0.05 ppm over 1 year and ±0.02 ppm over 1 hour is achieved by dynamic thermal control of the laser tube length to within a few nanometres. Linear measurement accuracy ±0.5 ppm over the whole environmental range ie, from 0 ºC - 40 ºC (32 ºF - 104 ºF) and 650 mbar - 1150 mbar. Readings can be taken at up to 50 kHz, with a maximum linear measurement speed of 4 m/s and a linear resolution of 1 nm; even at maximum speed. Integrated USB means there is no requirement for a separate laser-to-PC interface. LED status lights indicate the laser status and signal strength, providing a convenient alternative to the software's “on-screen” indicators. Switchable between standard (40 m) and long (80 m) range modes. Analogue I/O port allows for analogue signal output and a trigger signal input. Warm-up time is less than 6 minutes. External, switch mode power supply ensures 90 V - 264 V flexibility in input voltage. All of the above features make the XL-80 quick and easy to use. In accordance with (IEC) EN60825-1, Renishaw XL-80 lasers are Class 2 lasers and safety goggles are not required. Always refer to the system manual for safety details before operating the system for the first time. The XC-80 compensator is a crucial factor in your XL system's linear measurement accuracy. Featuring “intelligent sensors” that process the readings at source, the compensator very accurately measures air temperature, air pressure and relative humidity. Changes in these conditions can affect the wavelength of the laser light and the measurement readings taken. The XC-80 uses the sensor readings to modify the nominal value of the laser wavelength to give a true value, which is then used in calculations to virtually eliminate any measurement errors resulting from these variations. If you are interested in accuracy you NEED effective wavelength compensation. Uniform compensation - The design of the XC-80 and sensors ensures uniform and extremely accurate readings over the full range of environmental operating conditions. Frequent sensor updates - This can be done automatically every seven seconds, as indicated by LED status lights on the XC-80 unit. Integrated USB - The integral USB connection means there is no separate PC interface and no separate power supply (the USB supplies the XC-80 and sensors' power). Lightweight - The XC-80 weighs 550 g, and together with the XL-80, weighs just over 3 kg (including connecting cables, XL power supply and sensors). Intelligent air and material temperature sensors - The integral microprocessors analyse and process the sensor's output before sending digital temperature values to the XC-80 compensator. This offers more secure measurements and is a key reason why the XC-80 is so compact and also ensures sensors are fully interchangeable without comprimising accuracy. Up to three material temperature sensors can also be attached to the XC-80 compensator to allow linear measurements to be normalised to a standard material temperature of 20 °C. Versatile sensor cables - The standard 5 m long sensor cables are detachable for easy replacement and can be screwed together for extended lengths on longer machines. Note: Environmental compensation is NOT required for angular or straightness measurements when using a Renishaw system as these are calculated from differences in two beam paths close together, where the environmental factors self cancel. As rotary axis, flatness and squareness measurements are also based on these measurements they also do not require environmental compensation. 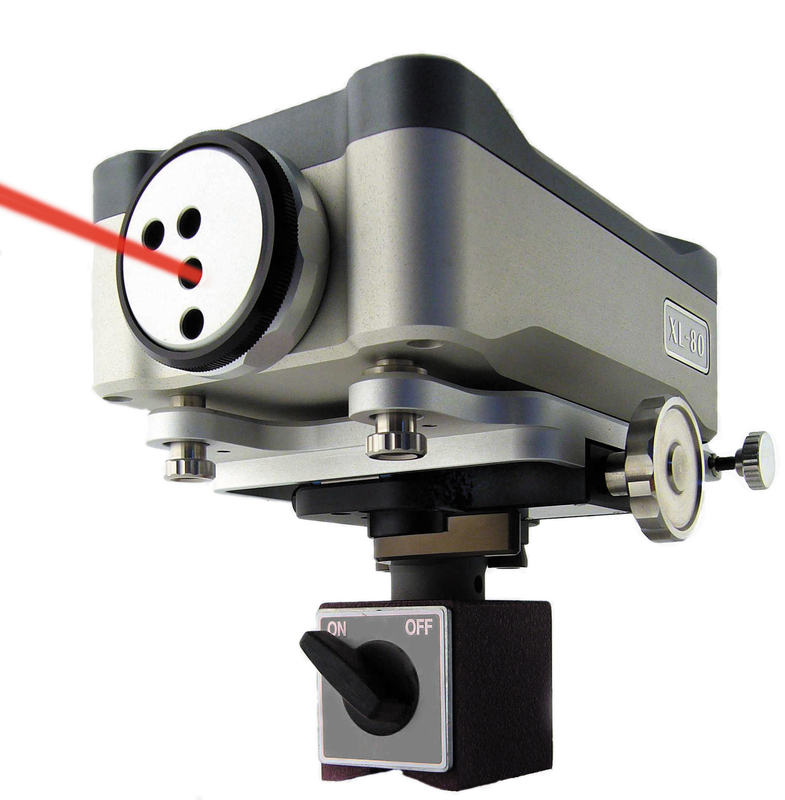 Unless you are using a dedicated measurement rig, then you are likely to need a mounting stage (and in most cases a tripod) to adjust the laser's position relative to the desired measurement axis. The XL mounting stage allows for precise angular rotation and translation of the XL-80. It is designed to be left attached to the laser unit for easy storage and quick set-up. A "quick fit/release" mechanism enables rapid and secure fixing to a tripod. For those applications where tripod mounting is not convenient, e.g. for mounting directly on a machine tool table, the stage and laser can also be mounted on to most standard magnetic bases, using an optional adapter with M8 thread. The new Universal tripod has been extensively tested to provide a stable, adjustable base in a compact, lightweight unit.